Teachers Day! Teacher Appreciation Week - Freebies & Deals! You are here: Home / *Easy Free Samples by Mail / Teachers Day! 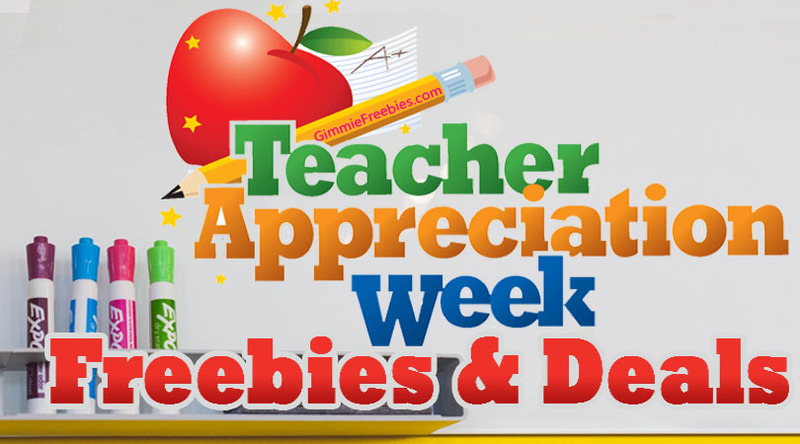 Teacher Appreciation Week – Freebies & Deals! Teachers Day is Tuesday, May 7, 2019. And, Teacher Appreciation Week is May 7 thru May 11, 2018. Teacher Day marks the beginning of Teachers Appreciation Week. As a result, we have a whole list of freebies and deals, and teacher appreciation gifts to mark the occasion. Firstly, Teacher Appreciation Week Freebies are a terrific way for educators to get the recognition they deserve on Teacher Appreciation Day and all year long. Because from free food to free admission, and the chance to win stuff for your classroom, our big list is a great way to educational tool to show how truly special they are. Then, if you’re looking for Teacher Appreciation Deals, then you’re at the right place! Because many companies show appreciation to educators all year long with discounts on items for the classroom. Educators should check with local businesses and retail chains for their specific offers. Consequently, we’ve listed a few favorites available on Teacher Appreciation Day. In addition, don’t miss the National Education Association (NEA) membership which can save you a bundle all year! After that, those with kids in school or anyone who knows a teacher should be thinking about teacher appreciation gift ideas, to recognize the great work these humble heroes do for our children every day! You can snag a free Teacher Thank You card in the list below, and then share this list with them so they can enjoy! Lastly, please share this list with teacher friends and educators! Most importantly, please stay tuned as we update this list for 2019. Applebees – Free lunch or dinner for teachers May 6. ID required. Check with your local Applebees to make certain they are participating. Arby’s – Check with your local restaurant for any special for Teachers Appreciation Week. Bruegger’s Bagels: As part of Teacher Appreciation week, Bruegger’s offers 20% off catering, and a free egg sandwich of choice with the purchase of a $25 gift card. Chik-fil-a – Check with your local restaurant for any special for Teachers Appreciation Week. Firehouse Subs – See if your local Firehouse Subs are offering any specials for Teachers Appreciation Week. Golden Corral – Check with your local Golden Corral Restaurant for specials celebrating Teachers Appreciation Week. Great American Cookies – GMC will have 2 for $5 Brookies at participating locations. Therefore, you can enjoy a brownie/cookie! Grimaldi’s Pizzeria –Teachers get 15 percent off dine-in and take-out orders Monday through Friday. ID required. Häagen-Dazs – May 14, 2019 is Häagen-Dazs’ Free Cone Day which is just after Teacher Appreciation Week this year. But, you don’t have to be a teacher to take advantage of the deal, which you can learn more about here. IHOP – Participating restaurant offer specials for Teachers Appreciation Week. Therefore, check with your IHOP to see. Krystal – Check with your local Krystal’s for specials for Teachers Appreciation Week. Oftentimes, when Krystal has an offer then White Castle has the same offer. McDonald’s – Participating locations offer free chicken McNuggets 6-piece meal. A valid teacher’s ID is required. MOD Pizza –50% off a pizza or salad at participating locations on May 8. No coupon is necessary. Show school ID to get this offer. Organ Stop Pizza – Teachers who show a school ID between May 7 and May 11 will receive a voucher for free pizza. Paragon Theaters – Free small popcorn May 1 to May 5. A valid ID is required. PDQ – Teachers receive 50% off of their entire check. Pizza Hut Teachers can sign up to receive up to 8 Free Pizza Hut Coupons per student in the Pizza Hut Book It program! Potbelly Sandwich Shop – Teachers, buy a sandwich or salad and get a free fountain drink or cookie with your order. Raising Cane’s – Free Box combo meal for teachers. May 8. An ID is required. Salata – Teachers eat free salad or wrap May 3-5. An ID is required. Subway – Check with your local Subway sandwich shop to see which specials they have for Teachers Appreciation Week. Sugar Shack Donuts & Coffee – Free house doughnut, likewise you’ll get 30% off all week. TGIFridays – TGI Friday loves teachers. So, check with your local TGIF for any Teachers Appreciation Week specials. World of Beer – Free Sam Adams or an Angry Orchard Cider. An ID is required. If you do not want the drink, then you can get $5 off your bill instead. Um, what? Zinburger – Free shake on May 8 to teachers and administrators at all of its 15 east coast locations. Teacher Appreciation Week: FREE ENTERTAINMENT! AMC Theaters – Check with your local AMC theater for Teacher Appreciation Specials. Colgate – will send teachers a box full of free toothpaste and toothbrushes in the Colgate Bright Smiles, Bright Futures classroom program! Crayola Experience – Teachers get in free every day, and their families get a 25% discount on Saturdays! Graceland – If you bring a valid school ID or dated letter with school letterhead, then you’ll get free admission to tour Graceland! Hot Wheels – offers teachers the opportunity to request a ton of free toys for their classrooms in Mattel’s Hot Wheels Speedometry program! Kennedy Space Center – Educators, administrators and program coordinators get free admission with a valid school employee ID. To clarify, you can download and print a coupon for one free daily admission ticket. Legoland California – Free admission on select Saturdays and Sundays throughout the year. Legoland Florida – Educators can get a Florida Teacher Pass to both Legoland and Legoland Water Park for free admission. To clarify, bring your most recent paystub, Florida photo ID, and teaching certificate to receive your pass. Marriott Hotels – Show your school ID at check-in. As a result, you’ll receive the special rate. SeaWorld – Teachers can get free admission for a day at Sea World Orlando, SeaWorld San Diego, and SeaWorld San Antonio. In addition, SeaWorld and Busch Gardens have been developing resources for educators for over 20 years. You can download entire teacher curriculum guides and individual activities, show the ShamuTV: Saving a Species series in your classroom, or learn more about how to prepare for careers in the zoological field on this site. Walt Disney World Swan and Dolphin Resort – Special room rate for teachers all year. First, we showcased the hottest free things you can get above. Next, we’ll show you a huge list of discounts. Certainly, you’ll look extra smart with these awesome savings offers! A.C. Moore – Teachers get 15% off entire purchase any time of the year. Certainly, this could add up fast! Adobe – Teachers can save up to 80% on Adobe products, all year long. On the other hand, Adobe products are very expensive so this can really add up! Amazon Prime Student – Anyone with a .edu email account can enjoy Amazon Student (a version of Amazon Prime) for FREE for six months! You’ll get free 2-day shipping, textbook discounts for rentals and purchase, and much more! Amazon Prime is awesome, however, getting it free for 6 months can’t be beaten! Ann Taylor Loft – Register to receive 15% off your full-price purchase in-store, every day! Sign up for their emails to get teacher-only deals! Apple Store – Apple Store discounts are almost unheard of! In other words, Apple coupons are hard to come by. But, for teachers, offers include discounts of up to $200 on computers and accessories through the Apple Education Store. AT&T – Save up to 17% on your wireless service for teachers and faculty. NEA members get a 15% monthly discount, 20% off accessories and more! Banana Republic – 15% off of full-priced purchases every day. But, a valid student or teacher ID required. Barnes & Noble – Every classroom needs books! And, teachers can receive 20% off publishers price on purchase for classroom use. Books-A-Million – Teachers will get 20% off all items purchased in-store. Costco – Teachers in the United States get more than $60 in savings if they sign up for a new membership. The Container Store– Our Organized Teacher program offers educators special discounts throughout the year to help organize their classrooms! Half-Price Books – Teachers receive 10% year round with Half Price Book’s Educator Discount Card. Hanes – Hanes offers 10% discount on purchases all year long. Hewlett Packard – HP Academy offers a 20% discount to teachers. You can also get free shipping. Hobby Lobby – Save 10% on crafts and school supplies galore at Hobby Lobby! To clarify, payment must be made with a check or bank card provided by the school. Home Depot – Home Depot pays the tax on classroom purchases made at Home Depot. With Pro Tax Exempt, public school teachers can save a lot! But, you must apply for the exemption. J.Crew – Get a 15% discount on in-store purchases. JoAnn Fabric – Get a 15% discount both in-store and online. Therefore, you could save on crafts, school supplies and more! K12 School Supplies – Don’t miss these hot deals to save 30-80% on closeout and clearance school supplies. Lakeshore –Besides having a ton of awesome supplies, if you sign up for their Teachers Club, then you’ll save 15% on purchases. Lenovo – Save up to 20% on laptops, tablets, and desktop computers. Michaels – Get a 15% discount on in-store purchases every day. Microsoft Store – Educational software discounts are available, including a totally free version of Office 365! Plus, save 10% off Windows devices. National Parks Service – From taking a “virutal field trip”, to free classroom materials (some are avialable to borrow too), and much more! Office Depot/Office Max – save 10% on most classroom supplies. Overstock.com – Get a free Club O Gold membership. In other words, Club O Rewards customers earn an average of $55.00 in Club O Reward Dollars per year. PBS – Get free access to digital curriculum-based resources. Certainly, that sounds fun, right? Pencils.com – Get 10% off all orders. Talbots – Get a 15% discount on regular-priced items. Teaching Tolerance Magazine – Free subscription for teachers. Scholastic – Save up to 75%! Staples – First, sign up for a Regular Rewards Card, and then call 888-636-9555 to enroll in Staples Teachers Rewards. As a result, you’ll get additional discounts on items such as classroom supplies. To sum it up, we’ve found a huge list of freebies and deals. But, don’t forget to say Thank You to your teacher with these awesome cards! BlueMountain – To begin with, see these printable cards for Teachers Appreciation Week. After that, they have these cards. 123Greetings – Next, check out these beautiful free ecards for Teachers! Of course, there’s one you’ll love in the dozens available! Greeting Island – Finally, these printable cards are for Teachers Appreciation Week. For example, you can even upload your teacher’s photo and customize your card! Scholastic – For instance, graphic organizers, school to home communications, reading and writing skill sheets and more. In conclusion, that’s it for now. Meanwhile, we will update the list when we find new items!